on capital is located in the North, and is only a short trip away from London. It obtains approximately 3,800 monuments and is the most visited city in the world. J’mapelle means My name is..
Oui means Yes and Non means No. Bonjour means Hello or Good Morning. Parlez-vous anglais? means Do you speak English? Où est…? means Where is…? France does not take U.S. dollars, so make sure you convert your money once you get there to their monetary system, the Euro. Currently the exchange rate is not in our favor at around €1.34 euro for every American $1.00. Book a flight. In the summer, traveling to Europe can be pretty costly. For example, an average flight in July for United Airlines from Philadelphia to Paris is approximately $2,600. Booking a hotel will add to these costs. As well as any tours or day trips you may plan, food, and spending. Make sure you account for all of these expenses before deciding to travel to the appealing Paris. *Note that Paris is also one of the most expensive cities in the world, so make sure you bring a hefty amount of spending money. Located on the Champ de Mars, this entrance arch was built in 1889 for the World’s Fair. 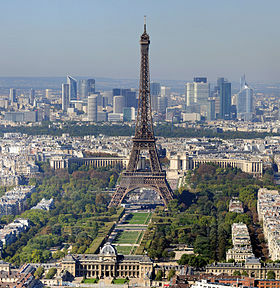 It is the tallest building in Paris, as well as a cultural icon for the French city. It is approximately 81 stories tall and attracts many tourists throughout the year. This famous museum holds works from the most influential artists known to man. The Mona Lisa resides within the Louvre, as well as more works from Leonardo da Vinci. It is located on the Right Bank of the Seine and is the most visited museum of the world. l Paris, the architecture of the cathedral is breathtaking. Make sure to climb the North tower and see hunchback Quasimodo’s vantage point. The world famous Roman Catholic Notre Dame took 100 years to build and is filled with sculptures and beautiful stained glass. The Arc de Triomphe is one of the most famous monuments in Paris. It is a monument to honour those who fought and died in the French Revolutionary and Napoleonic Wars. The names of these heroes are engraved on the inside of the arch. Beneath lies a tomb of an unknown solider from WWI. It’s close to the Louvre’s courtyard so make sure you check it out. And of course, Paris isn’t called the “fashion capital” for nothing. Make sure to check out all of the famous names such as Chanel and many more.